Despite being an endangered group, Elamobranch meat remains a highly prized product in many markets around the world; in Asia, for example, shark fin soup is considered a delicacy, with each fin fetching around US$50-150. Whilst there is no shark fin market in Greece, around 512 tonnes of elasmobranchs were caught in 2017 and their meat sold for human consumption. Shark meat in Greece is sold under the name ‘Galeos’ or ‘galeos drositis’; according to current legislation only Mustelus (smooth-hound) shark species should be sold under this name. However, a recently study by a team of scientists at the Alexander Technological Educational Institute of Thessaloniki and the University of Exeter has revealed that an astonishing amount of products actually belong to other species- around 56% (Pazartzi et al., 2018)! This market mislabelling is primarily the result of confusion over legislation and some degree of misidentification; many sharks are morphologically similar and some even exhibit cryptic speciation, meaning they are hard to ID. The problem of identification becomes even worse once the fish are processed; all external features are discarded, including the skin, fins and head to produce marketable steaks and fillets. Hence, tracking the species compositions of fish markets remains a difficult task and often requires specialist genetic analyses. Among the 13 shark species identified in Greek markets by Pazartzi and collegues, over half are listed in threatened categories by the IUCN in the Mediterranean. This includes the CITES protected thresher shark (Alopias vulpinus), the vulnerable school shark (Galeorhinus galeus) and the critically endangered angelshark (Squantina sqiantina). Species much larger and with little morphological similarity to the smooth-hound sharks were also being traded in markets, indicating the intentional and fraudulent deception of consumers. 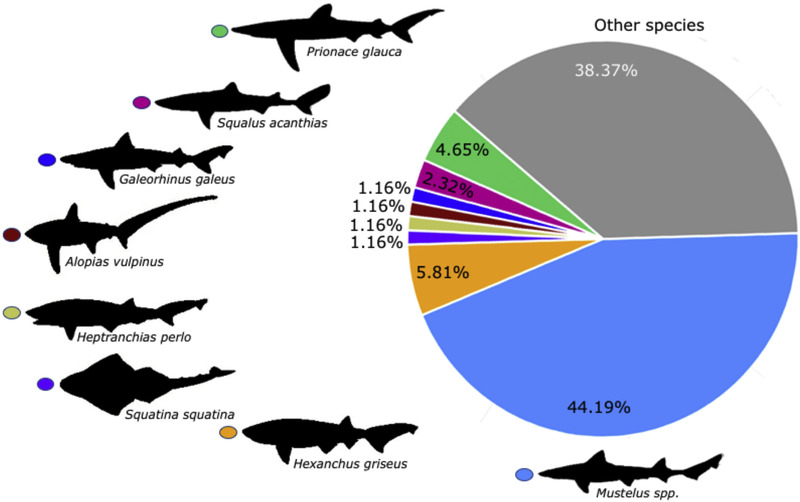 Above: Species composition (i.e., number of individuals) as genetically identified from the “Galeos” shark meat samples (Pazartzi et al., 2018). This mislabelling problem is exacerbated by a lack of awareness. Although consumers may try to avoid consuming vulnerable species, many are unaware that ‘Galeos’ represents shark meat, much like the “caçao” market in Southern Brazil. Furthermore, the sale of shark meat is continuing against a backdrop of population decline across the world. Whilst current legislation prohibits the exploitation of many threatened species, without a transparent supply chain the sale of these elasmobranchs can continue to slip through the cracks unregulated. Pazartzi et al. (2018). High levels of mislabeling in shark meat – Investigating patterns of species utilization with DNA barcoding in Greek retailers. Food control. 98; 179-186. Next Post Happy shark, fun shark, weird shark: why sharks have personalities.